Apartment Therapy just ran a list of 10 best wastebaskets - some with "more excitement." While many of them are very nice, and some of them are certainly unusual, they missed the following interesting options. 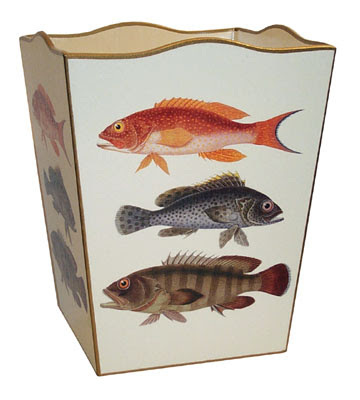 Let's start with the most unusual wastebasket I've ever seen. I'm sure it's the perfect product for someone. 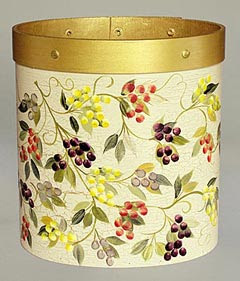 This one is made of bent wood and painted by a New England artist. Update on Dec. 27, 2010: This one doesn't seem to be available any more. 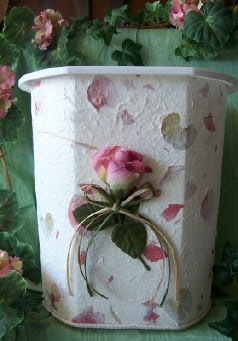 This beauty comes from Papers and Petals by Kay; most of her products are things like journals, wedding memory books, wedding albums, and keepsake boxes. Update on Dec. 27, 2010: I can no longer find this one, either. 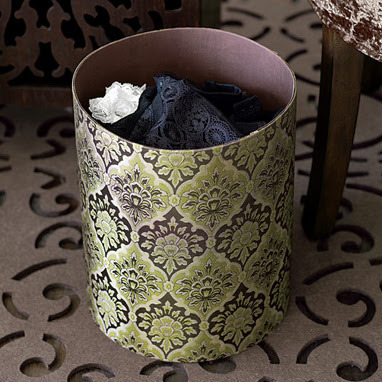 Brocade Home offers this fabric wastebasket with a cotton lining; it's also available in blue. Update on October 19, 2008: This wastebasket doesn't seem to be available any more. With 215 options to choose from, you can probably find at least one wastebasket here that you'd like! 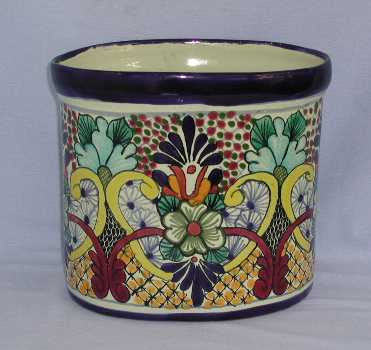 You can find more Talavera ceramic options at Tierra y Fuego, Direct from Mexico, and many other places. 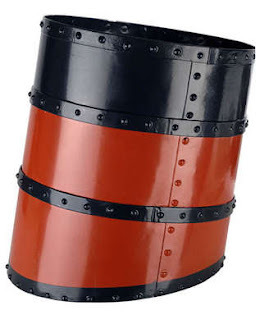 The Force demanded that I click through to see the R2D2 trash can and I discovered that it's now available again from ThinkGeek, on sale (using the term in its widest possible interpretation) for a mere $99.99! I confess that our home boasts a rather inconspicuously placed Yoda trash can, but it's a regular ol' wastebasket with cool Yoda pix on the sides. Think it cost about $25 back in the '80s -- a bit pricey, I suppose, but it still makes me smile! 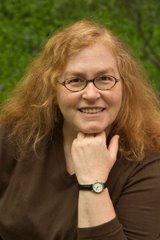 Cynthia, $25 for something that's made you smile for about 20 years sounds like a bargain to me!